The sheer vivacity and carefree appeal of blonde hair makes it one of the most sought-after colors in the world. At the same time, however, it is also among the rarest natural shades, but individuals interested in sunny locks can easily find the shade for them. Knowing how to care for the color and keeping it vibrant are other keys to a great golden do. Natural yellow shades are found in only two percent of the world's population, making the color nearly as rare as red hair. Golden locks are most common in Europe, particularly Scandinavia and other northern nations. Blonde is also a frequent color for children, but over time the hair may naturally darken into a brunette shade. Low levels of melanin pigmentation are responsible for light-colored hair, a recessive condition that can easily be overshadowed by dominant brown hair genes. Even in individuals where blonde is expressed, natural brown or red highlights often appear. All shades of blonde have a yellow tint - naturally white hair is a result of albinism, a complete lack of pigmentation. There are dozens of possible shades, from bright sunny hues to darker, sandy shades and "dishwater" or "dirty" colors with touches of brown throughout. Blonde strands of hair are the thinnest of all natural colors, making the hair naturally fine and potentially prone to loss or thinning. At the same time, however, naturally blonde individuals have an average of 140,000 strands of hair on their scalp, by far the greatest density of any natural shade. If you aren't one of the rare individuals with naturally yellow locks, it is easy to dye your hair to a suitable sunny hue. Before considering a drastic color change, however, consider consulting a professional stylist for advice about the specific shade to match your skin tone. Brunette hair can frequently be lightened to a near-blonde shade through careful highlights and lowlights, creating a more natural look than a straight dye job. Strong sunlight also lightens hair, and chemical treatments may not be necessary. Old-fashioned techniques for lightening hair include lemon juice and bleach, but these methods are generally either ineffective or dangerous and can severely damage hair or cause drastically unpredictable results. The best solution is to opt for standard dyes, whether you are interested in a platinum, bright shade or a subtle honey glow. Whether your sunny style is natural or dyed, caring for the color is the key to long-lasting hues. Over time the shade will darken; investigate mild methods to keep your hair bright if desired. Dark roots can be touched up. Avoid heavy styling chemicals that will weigh thin hair down. 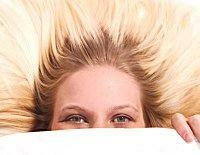 Consider root boost and other volumizing products to keep hair full. Use moisturizing hair products to keep hair healthy and sleek. Use shampoo and conditioner formulated to prolong the color. Avoid harsh chemicals such as chlorine or other strong substances that can react with the dye. Use color touch ups to keep the color consistent as roots grow out. Use moisturizing hair care products to repair damage from harsh dye jobs. It's no secret that blonde is considered a color of innocence, carefree fun, and a general joie de vivre. In fact, the adage "blondes have more fun" is so popular that many celebrities opt to create light locks, including Britney Spears, Pamela Anderson, and Paris Hilton. Many stylish celebrities, however, are already fortunate enough to have blonde shades, including Jessica Simpson, Suzanne Somers, Kelly Clarkson, and Christina Aguilera. Individuals interested in emulating these celebrity looks should carefully investigate the possibility of blonde styles. Blonde hair has become synonymous with a carefree, confident attitude and is one of the most desirable shades of color. With a range of hues to choose from, it is possible for anyone to have more fun with a lighter style, even if they aren't naturally blonde.